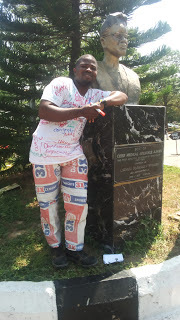 As final year students of Adekunle Ajasin University, Akungba-Akoko, Ondo State, graduate from the institution, a student with the name Morayo Samson Popoola (Sir Moraa) has celebrated writing his final paper in a grand style yesterday, November 14th, 2018. 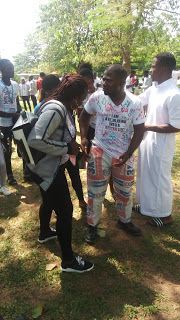 The student was seen putting a round neck with the description, "I am Atikulating into a better life", uses Dangote Cement bag as his trouser. 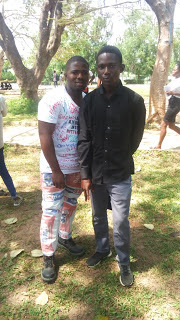 Could have made the history being a student of History and International Studies?. 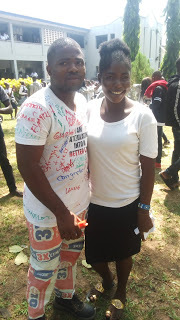 He made his own signing out unique and uncommon in the institution.